Today I was surprised to read someone’s prickly remarks about Advent. Their remarks watered the sacred tradition of Advent, its candles and liturgy and reflections, into the spiritual equivalent of weak tea. I was startled. And confused. And I felt myself burn with the malevolent wish to offer some prickly comments in return. I love the sacredness of Advent. Amidst the crazy shopping malls and hopped up frenzy of a so-called “War on Christmas,” I love Advent’s quiet waiting, its muted anticipation. I don’t need to shout “Merry Christmas!” over the beeping of a cash register to draw near to Jesus during Advent. I need to walk into the beautiful Kauffman Center for the Performing Arts, have a seat in Helzberg Hall, and listen with pure wonder to the beauty and the holiness of Handel’s Messiah. Then, I need to come home and play The Messiah over and over and over again. I need to buy coats for cold children and gloves for frigid fingers and food for hungry bellies. I need to gather around my piano with my husband and children and play and sing the beautiful hymns celebrating this season of anticipation. I need to sit in the quiet morning stillness with my cup of coffee and my Bible and my book of liturgical Advent prayers and my journal. I need to sit around my dinner table in the evening with my family and light our Advent candles, our candles of promise, of light, of hope, of love. I need to lie in bed at night and rest my hand on my belly and imagine what it must have been like for Mary as she waited for this baby, this promised one. 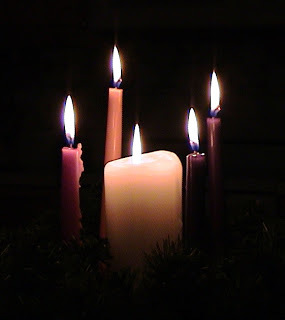 Tonight, as I sit and write this essay, I wish for you, I pray for you, the quiet longing, the aching joy, of Advent. As these days unfold I will light my candle of promise, my candle of light, my candle of love, my candle of hope. And I will pray that you, too, will feel the warmth of promise, of light, of love, and of hope. For unto this world, this world that is creaking under the weight of its grief, this world that is heavy with sorrow, this world that is splintered with evil…unto this world, a Child is born. Unto me, a Child is born. Unto you, a Child is born. Tags: advent, christmas, Handel's Messiah, Helzberg Hall, Jesus, Kansas City Symphony, Kauffman Center for the Performing Arts. Bookmark the permalink.